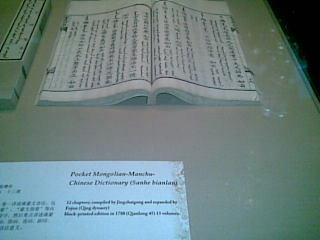 By accident we ended up in the multilingual dictionary museum of the Forbidden City. It was out of the way and away from the crowds surrounded by a cool garden. A welcome break from the heat and crowds around the main buildings. But we had a wonderful time inspecting the ancient Chinese multilingual dictionaries in Tibetian, Mongolian and other scripts. The pocket sized ones were the first keitai dictionaries.